Lego Ninjago: Masters of Spinjitzu – Season 4 (2016) – What's New on Netflix Canada Today! Long before time had a name, Ninjago was created by the First Spinjitzu Master by using the Four Elemental Weapons of Spinjitzu; weapons so powerful, no one can handle all of their power at once. When he passed away, his two sons swore to protect them, but the oldest, Lord Garmadon, was consumed by darkness and wanted to possess them all. A battle between brothers broke out and Lord Garmadon was struck down and banished to the Underworld. Peace returned to Ninjago as the younger brother, Sensei Wu, hid the elemental weapons in the far corners of Ninjago. Centuries later, Lord Garmadon has returned with the help of his Skeleton army to collect the Golden Weapons. Sensei Wu turns to the aid of four young Ninja who are to be trained to become the protectors of each of the weapons. 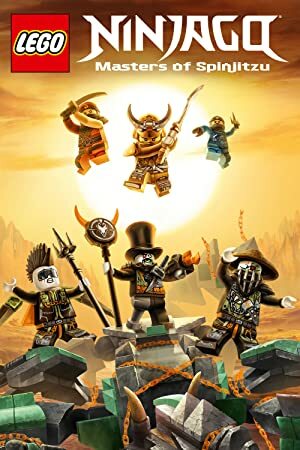 Although the Ninja successfully survive a harrowing quest to retrieve the elemental weapons, they fall into Lord Garmadon’s master plan, releasing the dark Lord from his prison, and allowing him to escape through a vortex, with hope that he would one day return with the ability to possess all four weapons. Peace has returned to Ninjago, while the four ninja swear to protect and learn to master their Golden Weapons… Awaiting Lord Garmadon’s return. The ninja get an invitation to master Chen’s tournament of elements and find out that Zane might still be alive. The ninja discover that the tournament isn’t about glory, but about Chen stealing everyone’s elemental powers. To drive the ninja apart, Chen pits Jay against Cole.